Received this on Facebook today...very true. 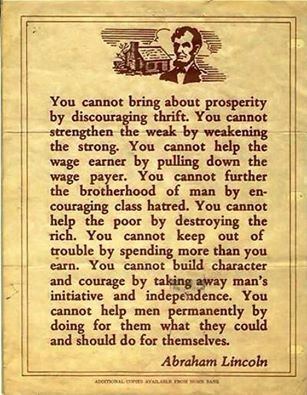 Written by a President known as Honest Abe and counter to every policy put forth by Obama. Good post! Too bad the people don't pay attention to these words. Yet Lincoln was the president who attempted to keep the union by destroying states rights. I guess you can't always apply the wisdom you know in the face of adversity. I believe he would have done anything to preserve the union and we still pay that heavy price today. The loss of states rights has been a thorn in our side ever since. Some states are beginning to take back what they own. It's good to see it happening.